On our way to the market in Naxos. “What do you want?” a small voice asked from somewhere near the deli counter where I was standing in a 7-11esque convenience store in Naxos, Greece. The question was definitely more a demand for information than an exercise in customer service. 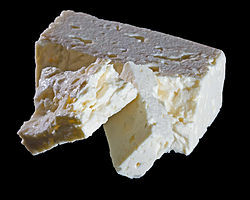 I peered over the counter and spotted a skinny eight-year-old Greek boy in neon board shorts and a faded tank top with “I’d Rather Be Surfing – Greek Isles” peeling off the front. He emerged from behind the counter because a shelf topped with various sausages and soft cheeses obscured his view. I looked around for an adult proprietor. An older woman with a tight bun, dressed in a loose-fitting floral sundress, sitting by the cash register seemed to fit the bill. A young girl wearing the same patterned sundress counted change next to her. Meanwhile, the proprietor read what appeared to be a Greek tabloid. The boy, however, moved directly in front of me. Despite the fact that I could have placed my beach bag on the top of his head, he was an intimidating presence with his arms crossed against his chest. Tapping his fingers along his tiny bicep, he waited for my response. It didn’t take body language fluency to figure out that this kid was irritated. Indeed, it was evident — he would rather be surfing. 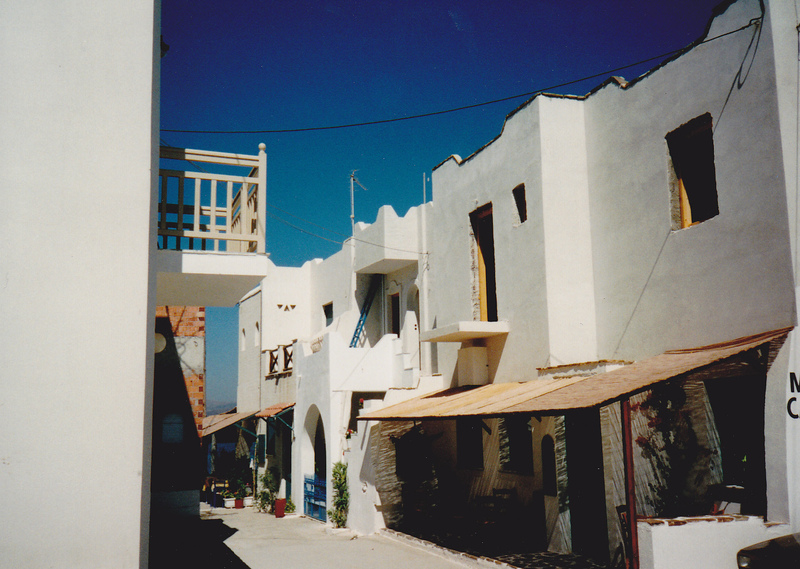 If you don’t speak or read Greek, communicating in the Greek islands will make you instantly feel like a child. One reason is that you are talking with children much of the time. Often, they help operate the family businesses — serving as translators, cashiers, decision makers and trouble shooters for their older non-English speaking relatives. It is not at all unusual to have a six-year-old, who has a solid command of English, wait on you. “What do you want?” The boy repeated his question, louder this time. I stalled. 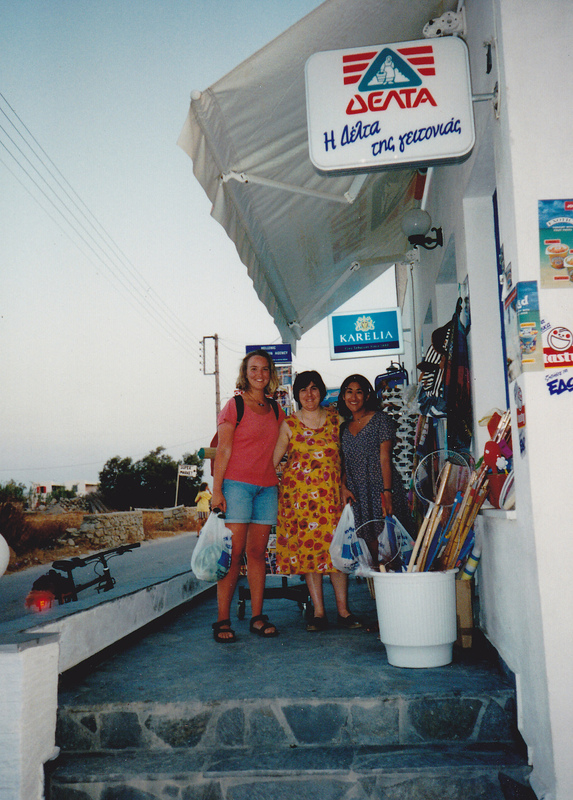 With my friends Indira and Katherine, I had stopped in this store close to our pension to grab some picnic supplies. Our lovely pension host had directed us to the store. We, like many travelers hitting a foreign convenience store, came in with only a vague idea of what to buy. This bilingual Byzantine boarder caught me off guard. I wanted to say, “please,” had I known the term in Greek; however, I could barely even ask for a particular product in English. “I’d like some cheese, please.” Decision made. It was best to go for something easy. “What kind?” he fired back. “I’ll take the…” while I waffled, I noticed the fingers tapping along his bicep again — like he was practicing chords — frustrated chords — on piano keys. “Some feta, please.” Relief set in. This had to be sure bet in Greece. “How much do you want?” was the next part of the interrogation. “No slices. We have only chunks,” he said while going back behind the counter, forcing me to either look through the glass or over it again. Suddenly prepackaged cheese slices seemed like an indispensable invention. I would never again dismiss Kraft singles. “A pound,” I blurted out. “Wait, no, a kilo,” I didn’t know the metric system either. At one point, when I was in grade school, during the 1970s, the metric system was familiar for about one month as the United States attempted converting to the system the rest of the world was using. However, quickly it seemed like too much work and unnecessary, as the US already had firmly established a haphazard method that everybody knew. I remember dutifully studying the ruler, counting the metric increments of an inch. Although it was abandoned, dividing units up by tens — the metric way — seemed to make much more sense. But surely this lad would know the conversions, and in English, no doubt, but I didn’t want to press his patience. This was especially true after he unveiled a knife that looked more appropriate for whacking off rainforest foliage while traipsing through the jungles of Sumatra. With this knife, he hacked off a kilo chunk of cheese. Coming back from around the counter, he held the dairy machete in one hand and the cheese in the other. I had to bend over slightly (and this I did at an angle) to get it from him. With a cheese chunk and a loaf of bread, fortunately available in serve-yourself bins, and a few other items I didn’t have to specifically ask for, I went to pay. Indira joined me. The young girl behind the register surveyed our baskets of goods. She reported the amount of drachmas we owed while the proprietor kept reading her Greek Enquirer. Because we were not yet acquainted with the money, Indira and I sorted through coins and sifted through paper bills. “Do you need help?” the girl asked. “Parakalo.” The girl said while placing the money in the register. “No, parakalo,” the girl repeated in the same speedy enunciation that she had used the first time. Katherine, our pension host and Indira standing outside the convenient store. “No, par-ah-kah-LO,” she said again this time with a hint of agitation. “Okay. Thank you,” I said in English. “You’re welcome,” she said with an eye roll. I recognized that expression. After all, I too had been an exasperated pre-teen girl, once, a long time ago. And, really, the eye roll was justified; she was dealing with some pretty clueless adults. This entry was posted in Culture, Europe, Greece, Travel, Uncategorized and tagged convenient store, Greece, metric system, Naxos, travel misadventure, Travel oops by stephglaser. Bookmark the permalink.